Where is the class location? Permit, notepad and pencil. All other class materials will be provided. A copy of the permit on the first day of class. The program is open to all Public, Private, and Parochial High School Students and all abilities ages 16 and up. Scheduling is done on a first-come first-serve basis. Early registration results in a choice of schedule. Scheduling with friends can be a plus but is not guaranteed. However, we will try to accommodate if possible. Please know that car and lecture assignments are subject to change, but will remain within the times selected. How will the course prepare me? GERSH DRIVER EDUCATION PROGRAM will teach the student the correct way to drive so they have a better chance to pass their road test on the first try. Although there are many reasons why a person may fail a road test, one of the most common is acquiring bad habits. Remember, to pass a road test you must drive like a new driver. QUALITY OF EDUCATION: It is extremely important in this day and age to be able to know your vehicle and how to react to a situation that may arise while you're driving. Knowing the rules and regulations of the road and learning how to drive defensively and offensively may save your life (and that of others) and help to prevent damage to your car. JUNIOR & SENIOR LICENSING: Taking the Driver Education Program will allow your child to achieve a junior license at the age of 16 and a senior license at the age of 17. Without a driver education program your child cannot receive a senior license until he/she is 18 in the State of NY. ROAD TEST PREPARATION: We will teach your child the correct way to drive so they have a better chance to pass their road test on the first try. Although there are many reasons why a person may fail a road test, one of the most common is acquiring bad habits. Remember, to pass a road test you must drive like a new driver. This means they have to learn a lot of information that we parents may have forgotten over the years. That is not to say that they should not practice with their parents to get experience. As a matter of fact, NY State requires a minimum of 50 hours of driving time (including 15 hours after sunset) to take the road test. The Driver Education Program will only provide about 6 hours of actual driving time. The Drivers Education program will show your child what they need to know to help them pass the road test. CHANCE FOR REDUCED INSURANCE COST: Most insurance companies will give your child up to a 25% discount on their collision and liability. You should check with your insurance company to see what their policy is for driver education students. SAVE VALUABLE TIME: It seems like our schedules only become more and more busy as time goes on. At Gersh Driver Education, we offer various course schedules that allow you to more easily fit your classes into your life. In addition to our 16-week course, we have an 8-week course available as well. We also hold classes on most days of the week so you are sure to find a schedule that fits your needs. 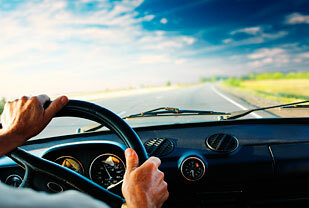 How many hours of driving time will be needed before the actual driving test? NY State requires a minimum of 50 hours of driving time (including 15 hours after sunset) to take the road test. The Driver Education Program will only provide about 6 hours of actual driving time. The Driver Education program will show your child what they need to know to help them pass the road test. Will my teenager qualify for a reduction in insurance premiums? Most insurance companies will give your child up to a 25% discount on their collision and liability. You should check with your insurance company to see what their policy is for driver education students. Lecture makeups do not have to be scheduled. The student can walk into the begining of any class any day. Just let the instructor know and they will be given an assignment to do. Please, always make sure a reciept is received. The lecture classes are listed below. Make up classes are decided in 2 parts: By the lecture teacher and by the in-car instructor. They must be made up within the session in which applicant is enrolled. There is a $25 processing fee (Payable to Defensive Driving School) for making up missed driving time. There is a maximum of 4 absences allowed. Failure to make up classes, or if more than 3 consecutive classes are missed, may constitute a drop and/or failure. Confirmation letters will be sent out to all students 1-2 weeks prior to the start of class. How much does driver education cost? Tuition is subject to change as inflation affects insurance, gasoline, and teachers salaries. Checks are payable to Gersh Academy or online via credit card (all major credit cards are accepted). A deposit of $100 must accompany your application and the full balance is to be paid by the week before the first day of class. (Cash, check or credit card). Tuition for classes can be found by picking the area you attend in the drop down menu on the home page. There will be no deposit refund granted for withdrawal after one week before the first day of the course. In the event of withdrawal prior to that a $25 cancellation fee will be charged. Telephone cancelations cannot be honored. Refund requests must be made in person or received by mail one week prior to the start of the course. After the start of the program there is no Refund. Will you help me with my Road test?